Every year when May comes along in Texas, people start to get excited. May has so many things correlated with it; prom, graduation, end of school, beginning of our long hot summer and everyone’s favorite Cinco de Mayo. Cinco de Mayo is observed in America as a day of Mexican pride & heritage and more often than not celebrated with lots of tequila! 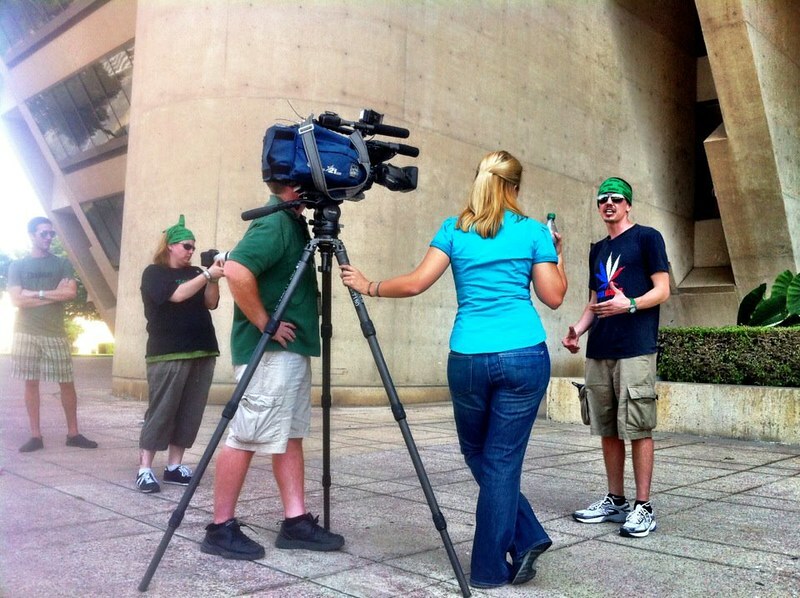 This year, DFW Norml put on an incredible event called the Global Marijuana March (GMM) throughout the streets of downtown Dallas, TX on May 5th, 2012. The event was called Cinco de Mota, with mota being the Spanish word for marijuana, it was quite fitting. This wasn’t your average afternoon meet up of a few stoners looking to make some noise. It was an epic event that brought people from every walk of life together with one common goal: ending the war on drugs. Sure we made a lot of noise, but how could we not? With the incredible line up of local bands, killer food trucks, local artists, local vendors and amazing Emcee’s, our message wasn’t going unnoticed. If you missed this years’ Global Marijuana March, here’s a recap, and remember its okay to be jealous! How about a 15 minute video recap? The local bands who made the event over the top not only showed up and played incredible sets, they did it all in the 95 degree Texas heat. If this isn’t dedication to the cause, I don’t know what is. We’d like to thank Pearl Street Riot, The Gypsy Bravado, Bum Lucky, The Effinays and Pistol Packin’ Mama for rockin’ us through the entire event. 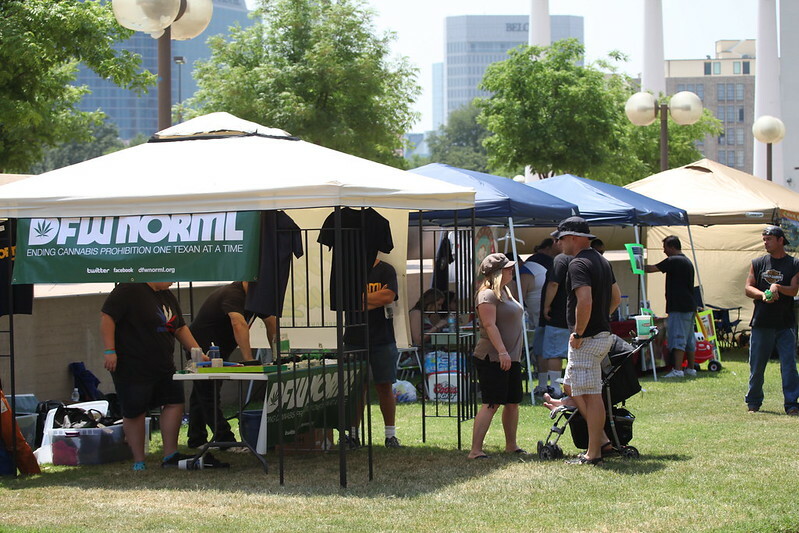 As if it wasn’t enough that you all came and blasted our faces off with tunes, members of each band ended up joining DFW Norml, and are fighting for the cause right alongside us all. There is power in numbers, and definitely power in music! Keep rockin and let the music keep flowing! Being at the event all day in the heat, the attendees weren’t left to starve and be parched of thirst. Four amazing food trucks came and made sure everyone had something to munch on & drink. Zombies Food Truck had incredible vegan cuisine that satisfied even the hungriest carnivore! The Wiener Man had, you guessed it, hot dogs. Not just any hot dogs, huge 100% Beef hot dogs, piled with different condiments! 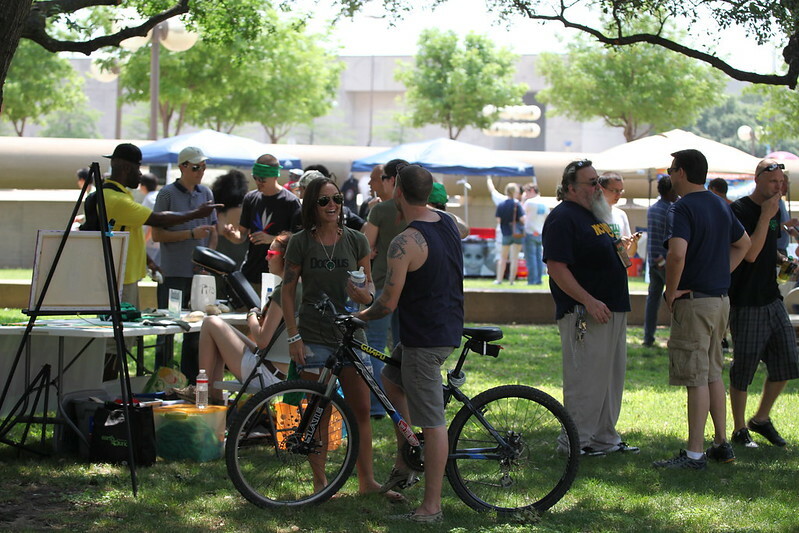 The Free Wheel’n Café was in attendance serving up Philly Cheese steaks that were to die for! No one left their line unhappy! What’s lunch without dessert? The Rockstar Bakeshop made sure to have plenty of goodies and desserts for all of our hungry attendees! A big thanks to all the food trucks that showed up and treated us to such amazing food and service! You all rock! “Radical” Russ got the crowd hyped, and prepared them for the day’s events! He spoke on various issues, one being the Daniel Chong vs. the DEA case, in San Diego. There is a reason he is called “Radical” Russ Belville, this guy knows his stuff and knows how to get the point across! Larry Talley updated the locals on the Dallas Drug Task Force that DFW Norml has been working on with our city officials & community leaders! The winds of change are blowing! Right before the clock struck 4:20, Shaun McAlister pumped the crowd up for our march with a compelling speech. He didn’t lecture us on why marijuana should be legal, he inspired us. His speech was the perfect catalyst to the excitement we experienced in our march! It kept us all going in the heat & against all the nay sayers! If the noise wasn’t enough to get the attention of passer bys, drivers on the streets & people in businesses, multiple flags and signs were paraded through the city as well! Among the signs and flags was one that definitely stood out. 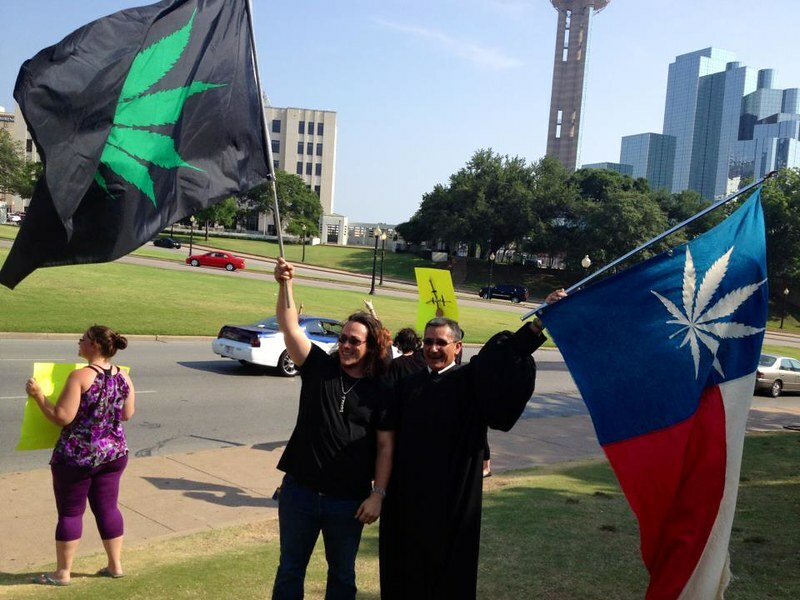 Rogues Rags & Grateful Dyed made it possible for us to have a HUGE Texas Flag with a white marijuana leaf as the star! It’s 100% hemp summer cloth and was created to act as a strong, patriotic symbol for Texas marijuana activists. People LOVE this flag; there were more photo ops with that flag than any other item at the entire march. Our Texas hemp flag was raffled off and won by our favorite hippie revivalist shop, Feed Your Head. Among the raffles items were a multitude things donated to the cause from our amazing vendors and volunteers! One of the most unique items was a piece of art done AT the event by BeyondGrasp.com. For those who were there, it was the spray painted Cinco de Mota painting with the Dia de Muerta face. We will be seeing this incredible artist at future DFW Norml events for sure. Thanks for everything that was donated! Marching alongside us were drummers dropping a beat for the activists to chant to. 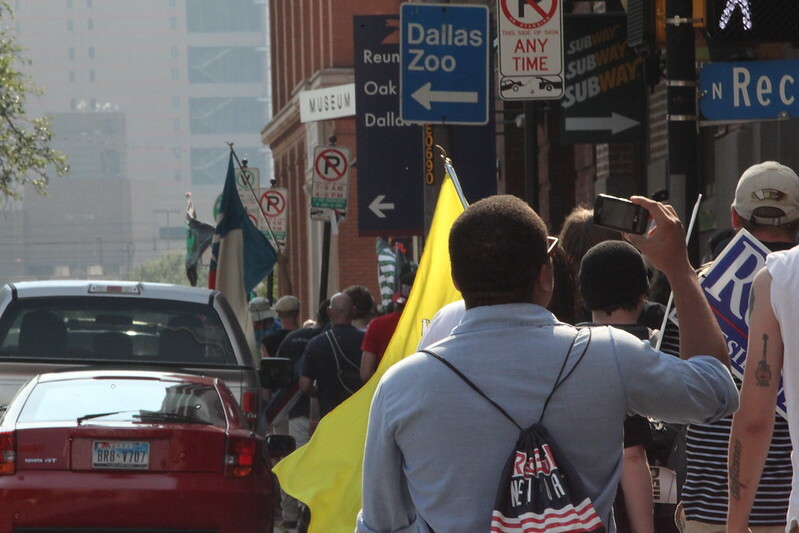 We caused such a ruckus with the noise, flags, signs and cheering that the streets of downtown Dallas were full of by standers chanting along with us! It was said that one of our police escorts was mouthing the chant and bobbing his head. It was quite catchy! If that wasn’t enough, we were all impressed by the crazy parkour going on by Urban Flight. These guys were jumping off ledges, flipping off walls, hopping onto each other’s shoulders and flipping like Thing 1 & Thing 2! It was incredible. Also marching were awesome women representing from the NORML Women’s Alliance! One woman made sure her voice was heard with a sign that simply read: “WE ARE NOT CRIMINALS”. The attendees there can testify to the various booths, tents and vendors everywhere! Feed Your Head, the Libertarian Party, Jewlz Baby!, Doobi.us & UNT Norml were there educating & representing. 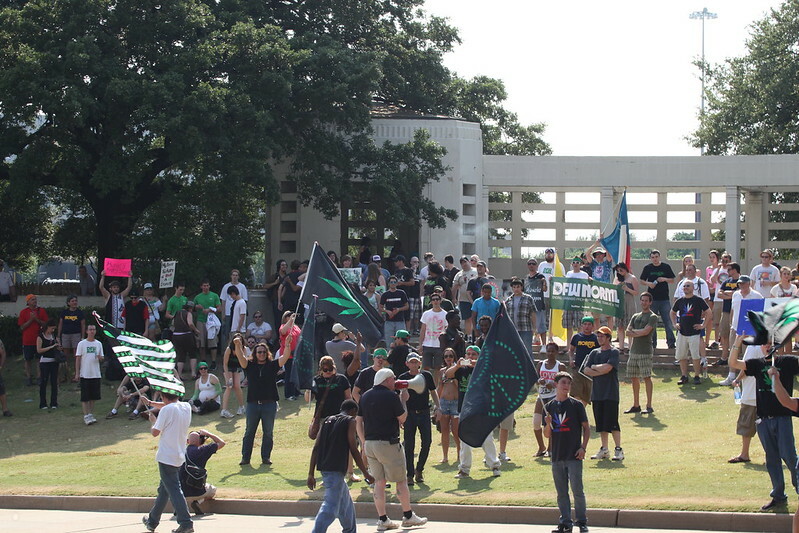 UNT Norml is the Denton UNT chapter of NORML, headed up by Tristan Tucker. Tristan Tucker is a veteran, a leader and an overall brilliant mind. There’s no one else that could lead this amazing new chapter! DFW Norml supports & strongly urges all activists to get involved with the chapter, and watch what we the people can get done! The entire time of Cinco de Mota, the atmosphere was filled with good vibes. NO body was a stranger. There was such a sense of unity in the crowd, it was very moving! When Janna Williams belted our national anthem while wearing a Doobi.us Luchador mask, it gave us chills. What a perfect song to sing before we exercised our rights by marching! This was an amazing event. As always, we couldn’t have done it without the support from our vendors, sponsors & volunteers! So many people stepped up and ran errands, passed out flyers, verbally spread the word, tweeted/facebooked our flyers, made calls and picked up trash! 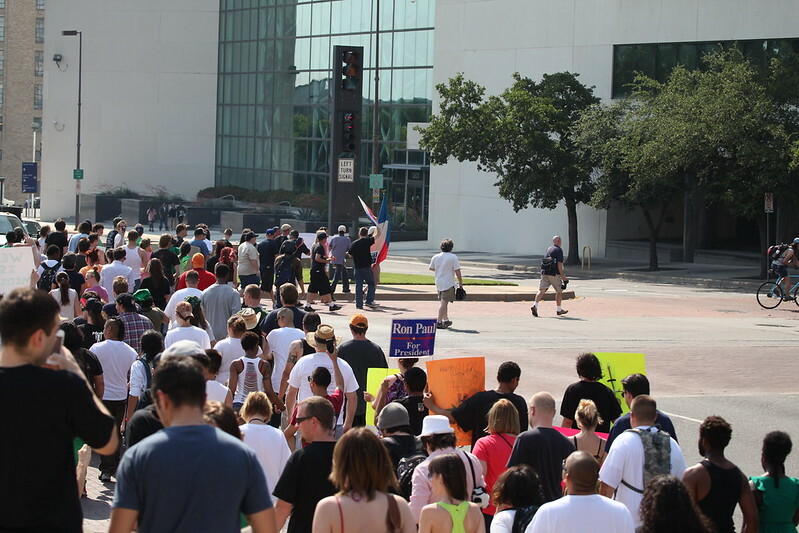 The Dallas Police were great at making sure everyone stayed safe, and didn’t make any arrests! 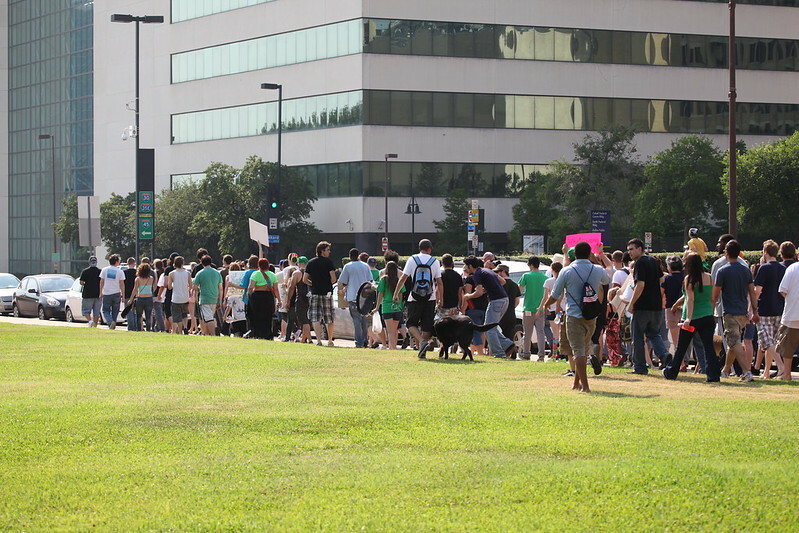 We couldn’t have been happier with the turn out, the official head count hasn’t been released but multiple said they counted around 420 people marching with us. This is just fuel for our fire, people want this ridiculous war on drugs ended, and there is power in numbers! 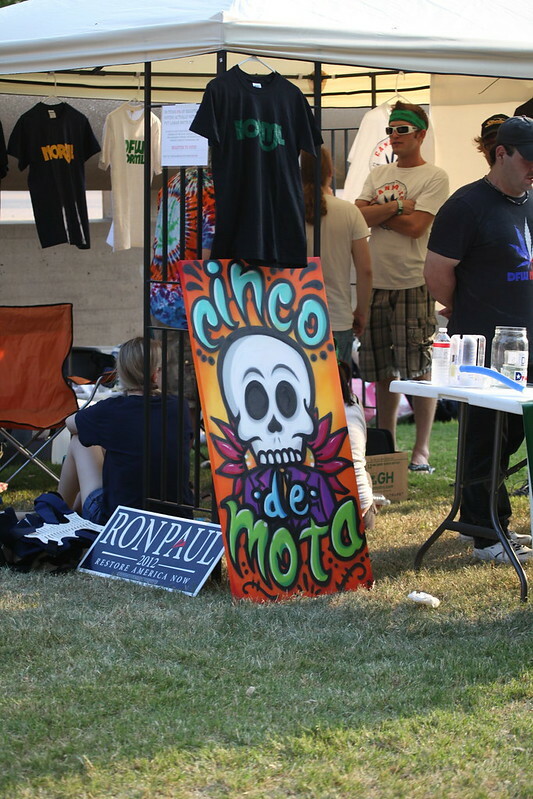 Can’t wait until Cinco de Mota 2013; let’s get 4,200 people marching the streets!